Even in this crazy heat, somehow my quilts feel light and cool, and strangely, in the winter, they feel heavy and warm. How is that possible? I was thinking about this at 3:40 this morning when I couldn’t sleep. Is it the cotton material? Is it the weight of the fabric? Does it have something to do with the quilting? Or is it because they are all little squares? What? As I tossed and turned the question over in my semiconscious mind, I quickly dozed back off, no closer to solving the scientific make up and physics of my quilt. I mostly just felt the love that was stitched in every square and a big hug from my grandmother. Love this! 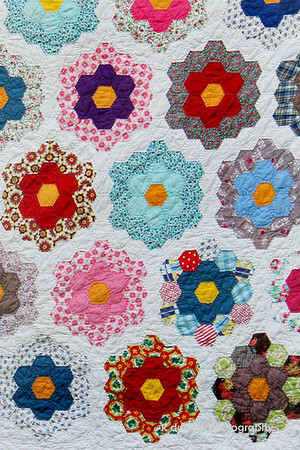 I have an old quilt in the exact same pattern, crazy mis-matched colors just like this. You're right, they are warm in winter and cool in summer -- unlike fuzzy blankets.